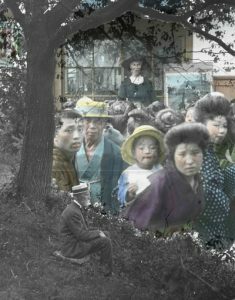 Take a rare glimpse into Japan in the 1890s-1920s through the photographs taken by a Canadian missionary, John Cooper Robinson. We can only begin to understand Cooper Robinson’s photographs by overlaying both Canadian and Japanese historical contexts and perspectives. Join our symposium led by art historians and historians who specialize in Japan and Canada, to explore ways in which the Cooper Robinson photographs can be used and made relevant for future research and teaching. Symposium attendees will have the opportunity to visit the ongoing curated exhibit at Rare Books and Special Collections (RBSC). Friday March 24, 12-4 p.m.
Hamish Ion is a Professor Emeritus in the History Department, Royal Military College of Canada. He is a specialist in modern Japanese history. The event is free and open to the public. For more information, please contact Japnese Language Librarian Naoko Kato at naoko.kato@ubc.ca.